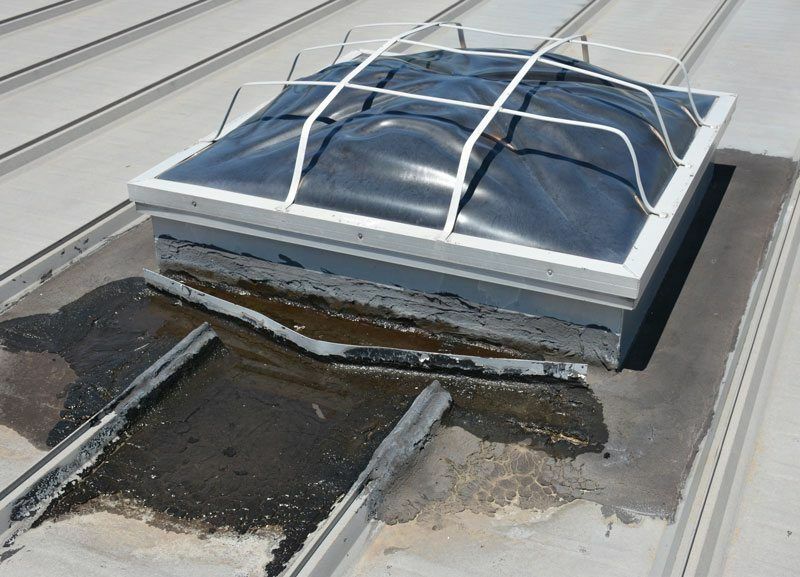 We typically find that leaks from skylights on flat roofs, develop because of the degradation of the rubber gasket in between the window and window frame or the flashing around the curb that connects the skylight to the roof system. We install and repair all skylight leaks on flat roofs in Pittsburgh, Monroeville, New Stanton, Stamford, Greenwich, and White Plains. 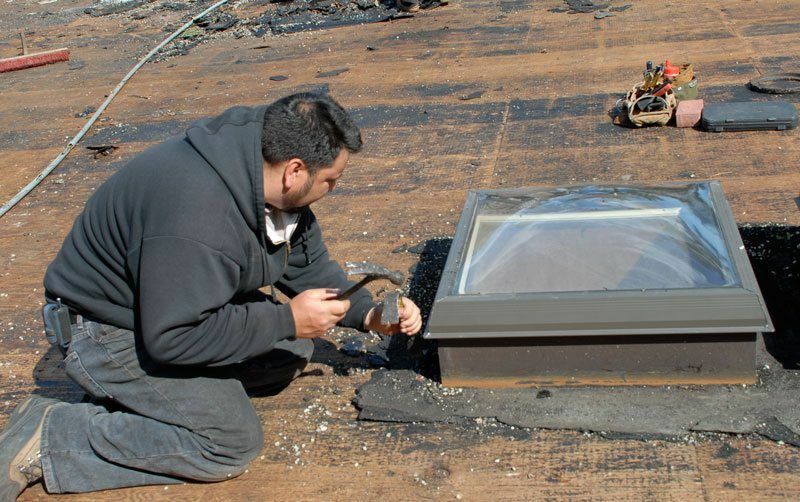 Installing new skylights is easy, however, repairing them can be a little more costly if there is degradation beyond the rubber gasket or curb flashing. 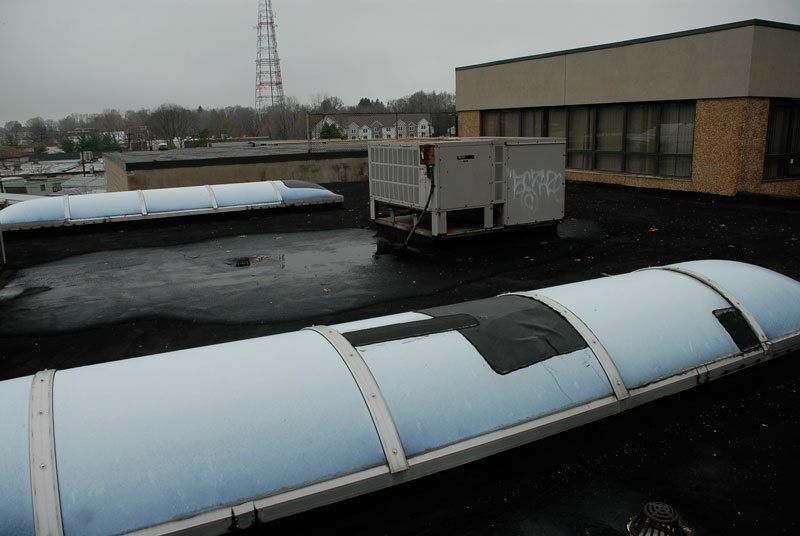 If the extent of the leak involves any degradation to any portion of the rubber roof, we will gladly include the installation of a 2-ply Modified Bitumen membrane in that area, in addition to the replacement of a rubber gasket or curb flashing. When a room does not have windows, the best way to get natural light into that room is to install skylights. They can set the tone by enhancing the look and feel of a room. There are many types of skylights available in both glass and plexiglass. To install a skylight, determine the size of the opening and carefully cut through the roof. A skylight consists of 2 parts; the curb, and glass or plexiglass sections. The curb is the base that sits over the cut hole in the roof and is installed separately from the glass section, but both are secured. Metal flashing is part of the curb, and the Modified Bitumen 2-ply membrane fused to it for a leak-proof seal. Skylights are notorious for leaks. When we are called to repair a leak around a skylight, the first thing we check is the condition of the roof; the type of roofing material and the age of it. Each roofing material has its technique for installation. 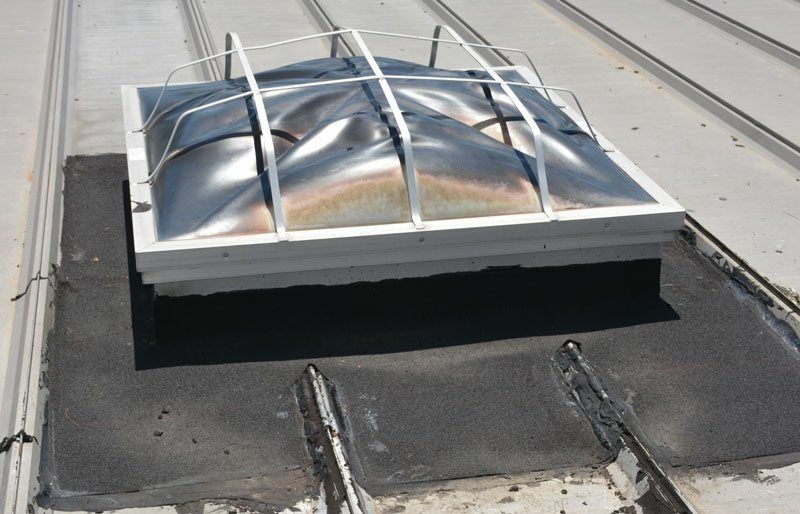 Often, we find that skylight leaks can stem from the roofing material that has separated from the flashing due to age; single-ply rubber roofing usually degrades due to shrinkage and ultraviolet degradation. Another common leaking problem can be the brittleness of the rubber gasket. 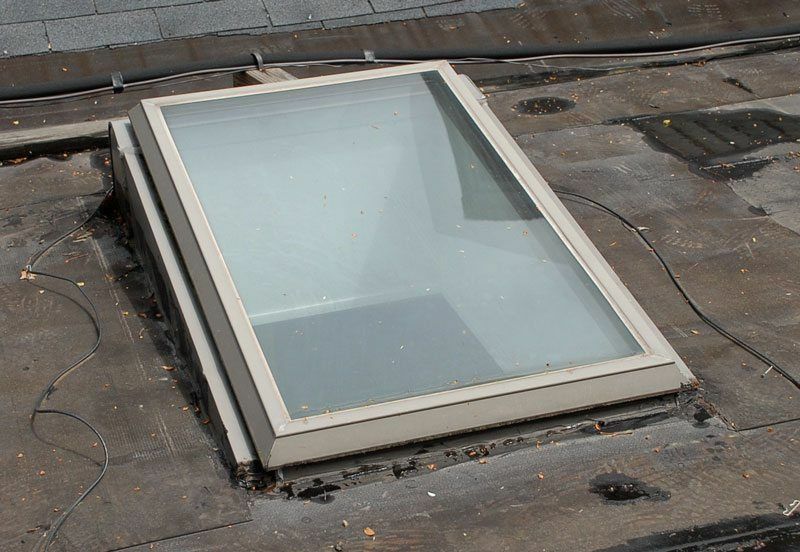 Skylights have a metal frame whereby a rubber gasket is used to seal the window to the frame. This is a skylight with a metal frame holding the glass in place. In between is a gasket that seals the glass and the metal. Part of the curb and flashing is exposed. The gasket will get hard over time and crack causing a leak. Why Does a Skylight Leak? A metal frame secures the plexiglass on this skylight below. The rubber gasket between the metal frame and plexiglass will deteriorate over time need replacing. There are many types of skylights that takes on all kinds of shapes. 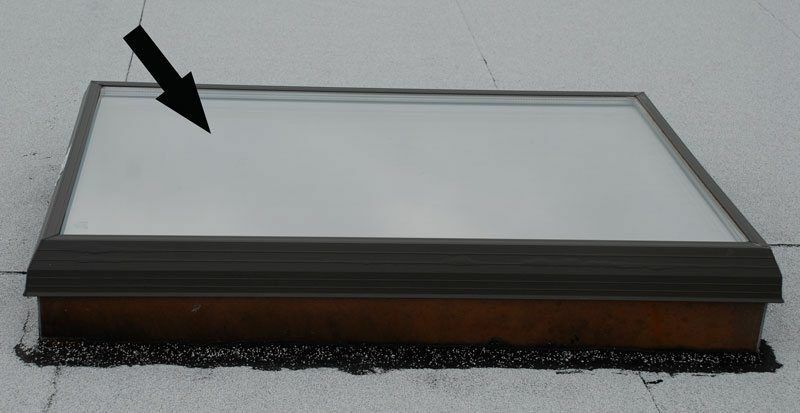 The important fact to remember is when you install a glass skylight, the curb should be angled so water will not collect inside the frame that holds the glass. Most commonly plexiglass skylights that are domed are the best choices for a flat roof. 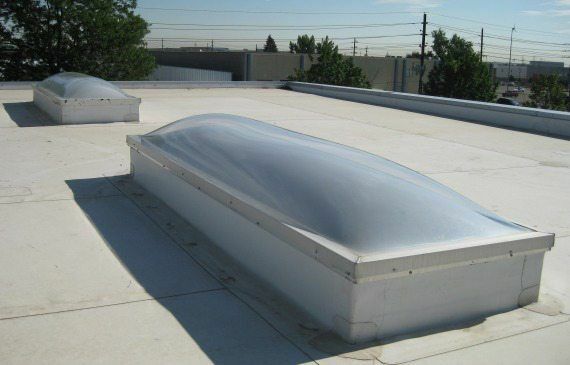 The plexiglass skylight is ideal for flat roofs, but they will need maintenance or replacement over the years due to ultraviolet damage to the plexiglass itself. Removing the curb on this skylight while installing a new roof. After the roof was done, the skylight was re-installed. 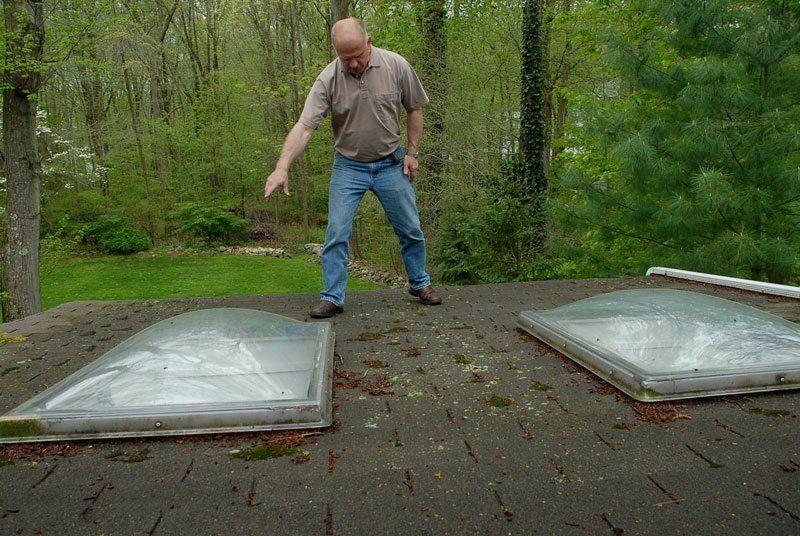 The proper way to install a skylight is to have it sit on a curb as seen in the image to the right. The curb helps to make a transition to the roof and also keep the skylight above the water and snow levels when a roof floods. These are the best type of skylights for a flat roof. They stay clean, and water and snow do not collect on top. 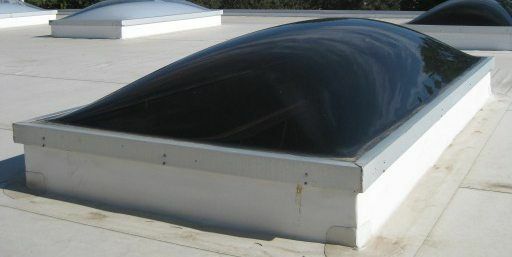 Plexi Dome skylights are very common and can last up to ten years without any maintenance. It often happens that water will pool on a flat roof. Pooling water can eventually penetrate through the roof’s rubber membrane and metal flashing of a skylight resulting in a leak. The best solution, in this case, is to slope or build the roof up so water will not pool. The curb can also be raised, but that is not the best remedy because water will continue to pool there and penetrate the membrane again and again. Velux is known for quality skylights, sun tunnels or roof windows. They also market solar, electric and manually powered skylights. No matter what the application is, they have the proper product for you. We have installed this brand many times without incident. As in the many repair calls, we have answered, the issue of leaking is not the fault of the skylight itself. Instead, it is the installation technique. It is essential to install the flashing correctly. A pitched roof has a different kind of flashing requirement than a flat roof. Sometimes, a carpenter or roofing contractor will not know the difference and install the wrong flashing on a flat roof. Wasco is another manufacturer of skylights. Wasco has all shapes and sizes and specializes in the acrylic type of skylight. If you want a circular or extended vault type of design, they are known for those kinds of specialty designs, as well. There are many types of skylights, but they all have the same primary type of construction. A skylight has two parts; the glass section and the frame section called a curb. Some manufacturers will sell a curb with a skylight, and some don’t. A carpenter can make a curb; it’s a wood frame. Regardless of the type of curb, some metal flashing has to cover. Skylights on a Shingle Flat Roof. When a roof is relatively flat, as in the picture below, shingles are not the best roof system to consider for installation. Shingles on a flat roof with any number of skylights is cause for concern. It will not matter how well the skylights are installed, many leaks will occur within a relatively short amount of time. The person who installed the roof did not know that the pitch was too low for the installation of shingles. Secondly, the skylights now had step flashing, and the curb was too low to the roof itself. Weakened Plexiglass: All skylights need maintenance. Depending on where a skylight is located on a roof, a plexiglass skylight may deteriorate and crack over time. If it is located in direct sunlight throughout the daylight hours, it will have a shorter life span id there is no protection from the ultraviolet sunlight. The glass in skylights will last almost indefinitely but the seal between the glass and the frame is will need maintenance over time. Weakened Plexiglass: All skylights need maintenance. 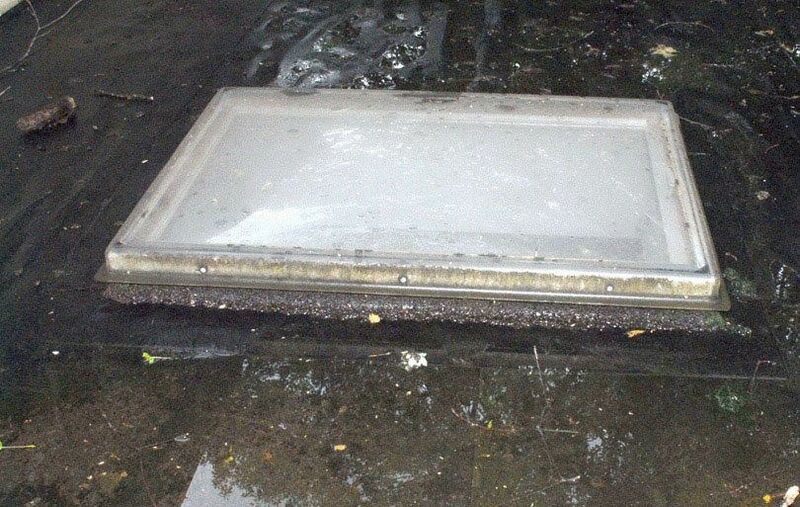 Depending on a skylights location, a plexiglass skylight may deteriorate and crack over time. If the area is in direct sunlight throughout the daylight hours, it will have a shorter lifespan id there is no protection from the ultraviolet sunlight. The glass in skylights will last almost indefinitely, but the seal between the glass and the frame will need maintenance over time. As with all skylights, the frame that secures the glass has a gasket secured in between them. Theses gaskets dry out, shrink and cause leaks. It is not easy to replace a gasket on steep shingled roofs, but on flat roofs, regular maintenance is much easier. Most of the time people use caulking to reseal a skylight glass to the frame, but if the appearance is an issue, it is best to replace the entire gasket. 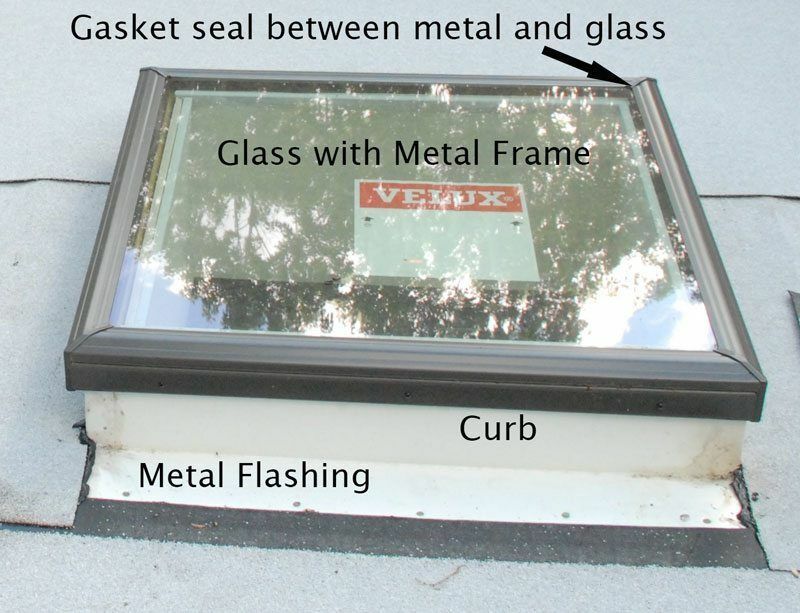 This atrium-style skylight on a flat roof can be maintained regularly to ensure the gasket between the glass and the metal frame remains strong and leakproof. Skylights are a very nice feature to add to a home or commercial building, but consideration of many factors before installation is necessary. One such consideration is the angle for which it will best appear, be accessible for regular maintenance, and have little need for continuous repair. If completely level, these things will collect debris that should have washed away during rainstorms. 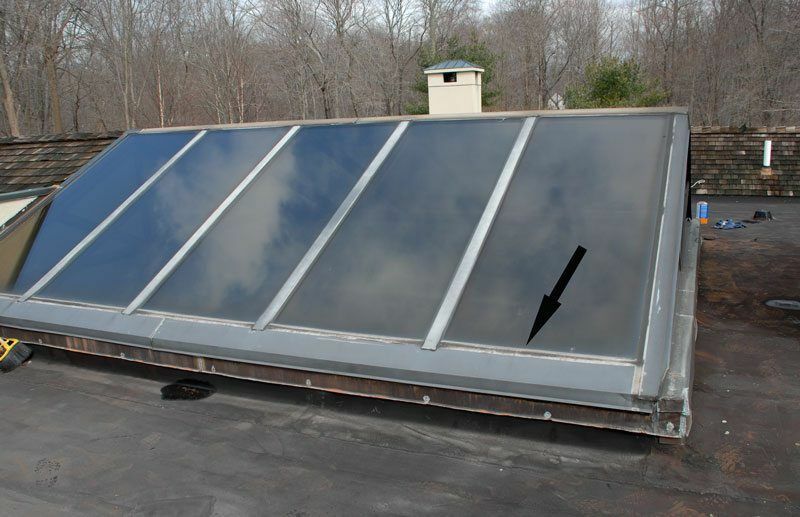 When installing a skylight on a flat roof, installing one without an angle will need more maintenance around the curb (notice the smeared tar). 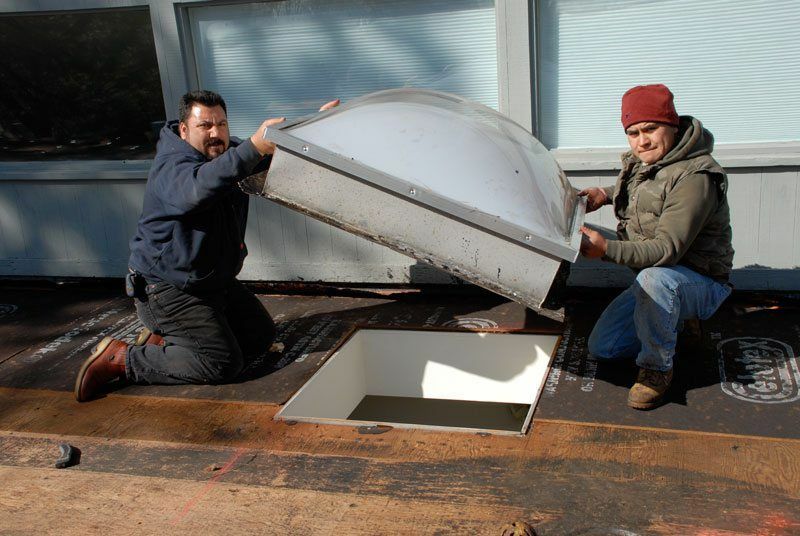 Skylights installed on a curb that is angled will prevent water and debris collection. For instance, care should be taken to install a skylight at a slight angle so that water and debris do not collect on the glass or around the curb. 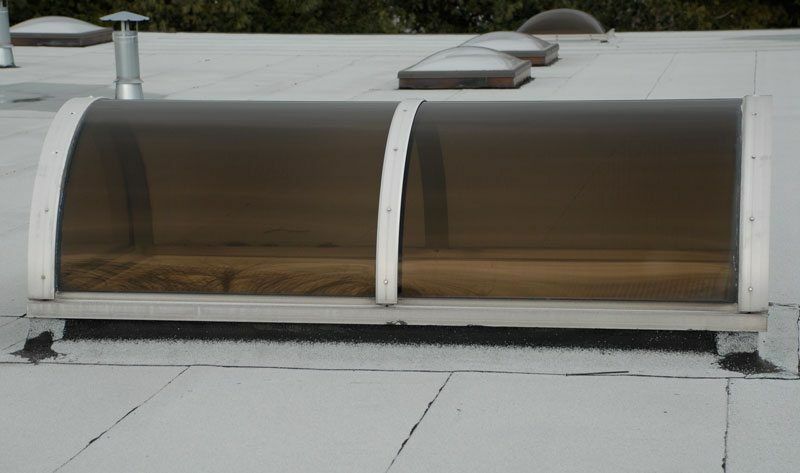 One can purchase skylights for a flat roof with angled curbs that can be professionally placed for water flow toward a drainage system. Its best to install a glass type of skylight with an angled curb. That way water will not collect on the glass and debris will wash off. It is essential when installing a skylight on a flat roof with curb flashing that is in one piece. Welding the corners where the flashing meets the curb is necessary. 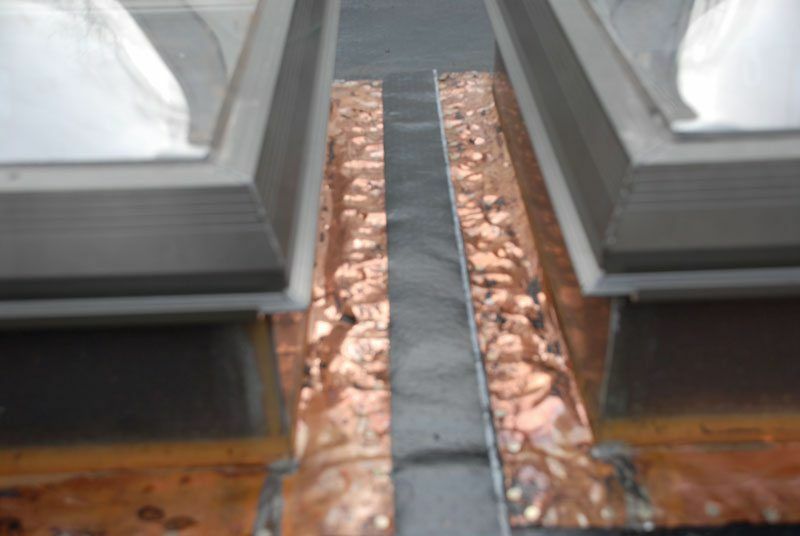 Just as crucial for a watertight seal, the flashing must also be clean from debris or tar. In the case of EPDM rubber, the flashing on the right will not work. To create the best transition from metal to the roof, we use the Modified Bitumen Torch Down membrane to fuse the materials together. 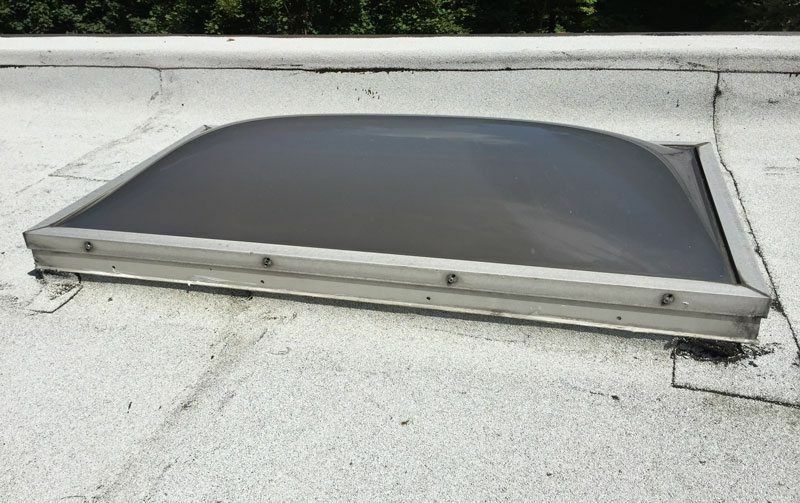 It is labor intensive work to clean and prepare the flashing of existing skylights, however, it is a very important process that must be done properly because the new rubber membrane must be attached to the metal. Wasco Manufacturer makes These Bubble skylights. They are very popular on industrial, commercial roofs because they allow ample light through. It is difficult for debris to collect on top of them. They also come in two parts; a curb and glass section. 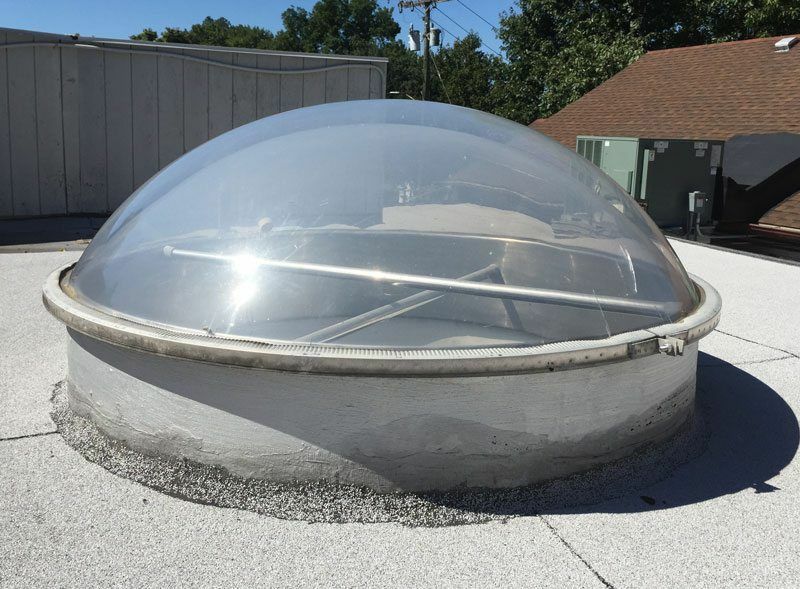 Despite their effectiveness and low maintenance needs, they do not last as long as a glass skylight because the plexiglass dome becomes brittle and will crack over time. This is called a bubble skylight. They are very popular on commercial roofs. The best choice for a flat roof skylight is a domed plexiglass skylight. Debris and dirt will not collect on top. Skylights add a specific effect to a room. Some skylight windows are tinted. Some have an atrium look. Still, others have a tunnel look which all give a place more natural light. There should never be a problem with any skylight leaking. If the installation of the flashing is correct, and regular roof maintenance becomes part of a homeowner or business owner’s routine, then the damage from leaks will not be a costly issue. As in the picture to the right, pouring and smearing tar to seal the flashing of a skylight onto the metal roof is an improper procedure. In a short time, the tar will dry out, crack, and leak water to the interior of the structure. 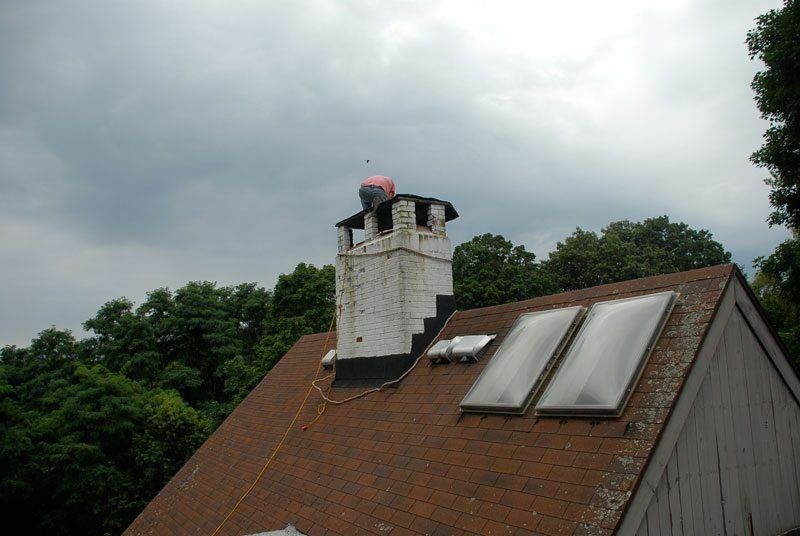 We have seen smeared tar used as a common fix for leaking flashing of a skylight. Removing the old tar around a skylight on a metal roof is laborious and becomes an added expense to the building owner. This what it looks like after the rubber membrane has been installed. This membrane will last for many years to come and will not crack with the expansion and contraction of the metal during heating and cooling conditions.